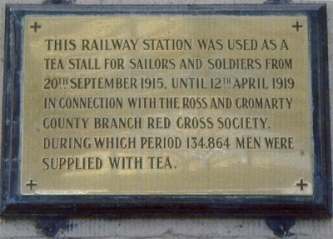 Last summer a plaque commemorating the Jellicoe Expresses was unveiled on Thurso Station. Our thanks go to Ian Grant for providing us with this account and also to Mario Luciani for this photograph. Boarding the Jellicoe Express at Thurso rail station in January 1943 was to prove a major adventure for Duncan Cormack. Then 17½, he was heading for Devon to join up with the Royal Marines. Amid the throng of troops waiting to get on the steam-train, he was undoubtedly one of the least travelled. "I had never been further than Helmsdale in my life before that," he recalled yesterday at a small ceremony held to commemorate the troop-train service between London Euston and Thurso that ran in both World Wars. "After we arrived at Euston, I had to get connections to Exeter and Exmouth before joining my ship." Mr Cormack, a Burma Star veteran, had already experienced the horrors of war during his secondary schools days in Wick where 10 children were killed when Luftwaffe bombers strafed the town in 1940. 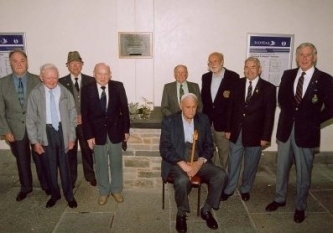 The retired Thurso police sergeant was one of eight veterans present at the unveiling of a plaque within Thurso rail station to the service which was conceived in 1917 by Admiral John Jellicoe. Up to 500 troops would be packed into the train on its 24-hour trip, with some mastering the art of being able to sleep while standing up, wedged between others and luggage. Despite the lack of creature comforts, Mr Cormack has largely fond memories of the three return trips he made in the course of World War Two. "It was really a marvellous journey even though conditions were very cramped," he said. "It was a struggle on the train to find a seat and I had a kit-bag and a hammock and a rifle, which took up quite a bit of room so it was a case of survival of the fittest." Mr Cormack said that on the eight-coach trains, personnel from the far north would be heavily outnumbered by colleagues from the south, most of whom were based with the fleet at Scapa or at air bases in the far north. "Us locals travelling up and down were going in the opposite way to the remainder of the train. They would be going back on leave when we were going back off leave and vice versa so there was a difference of opinion occasionally." Mr Cormack said the Salvation Army ran a canteen on the train. He remembers it costing a shilling for either pie and beans or sausage and chips. The trains left at night which meant the blinds were drawn and a canvas placed over the engine-room to try and prevent the flames from the hot coals being spotted by an enemy plane. Retired Thurso bus inspector Finlay Swanson, 83, a rifleman with the Cameronians, made one return trip on the Jellicoe. Like Mr Cormack, he recalls the contrasting moods on board. "On my first trip which was from Euston, I was one of the very few going on leave with almost all of the rest of the train heading up to serve on Orkney. "But on my second trip the roles were reversed as I was heading for a spell of duty on December 21, 1940 while they were all going home for leave for Christmas." Orcadian Peter Wilson, a mechanic with the RAF, was a regular passenger on the Jellicoe. "It was very busy and it was very hard to find a space for yourself. It was quite horrendous at times but you just had to make the best of it. "It was very difficult to sleep though I was small enough to get an occasional nap on the luggage racks." Like his former comrades, Mr Wilson is delighted with the overdue commemoration of the troop trains. "If you speak about it to local people, nobody seems to know the name Jellicoe or know of the existence of the trains." Mr Wilson worked at the naval base at Lyness before moving to Caithness where he had spells at Dounreay and Vulcan before retiring to live at Halkirk. The idea for the ceremony came from the Thurso branch of the Royal British Legion Scotland which got together with Railtrack and ScotRail to provide a permanent memorial. Railtrack donated a plaque which was unveiled yesterday by branch chairman Alex Cameron. Mr Cameron recalls as a boy seeing the mass of servicemen boarding and getting off the wartime trains in Thurso. "There was a tremendous amount of men and it's amazing how the bus and ferry services coped taking them to and from Scapa Flow." Mr Cameron said the service was dubbed the Misery Express due to the crowded conditions on board. Also present at the ceremony were several women who ran WRVS food stalls to feed the Jellicoe passengers.